AshtonTucker provides Packaged Water Treatment Plants for private developments and small communities. The combination of buoyant media adsorption, and proven granular media filtration provides a low cost solution to your drinking water needs. Larger systems up to 1 MGD are also available. Contact Us to request a quote that meets your needs. One of the most important things that private developments and small communities should can provide is safe drinking water. People often fail to realize how important this is to their overall health, and many are simply content with water that “looks” clean. Unfortunately, we can’t always judge water’s cleanliness by just looking at it. More often than not, the harmful organisms and particles are visible only under a microscope, and can find their way on our taps and drinking fountains. At AshtonTucker, we know how important it is to ensure the safety and drinkability of water. We provide packaged water treatment plants as a low-cost solution for private developments and small communities, including a range of water treatment equipment and a systems for pH control. Our package plant is a smaller version of a water treatment facility, and the combination of buoyant media absorption and granular media filtration makes sure the water that goes into your tap is always safe to drink. Despite being smaller, it integrates all the important parts in the water filtration process, such as aeration, coagulation, oxidation, and sedimentation, to name a few. In addition, we offer water treatment plants in areas that are metal heavy; we also remove traces of iron and manganese in water. At AshtonTucker, our package plant is a low-cost solution to make sure private developments and small communities get usable and safe-to-drink water. 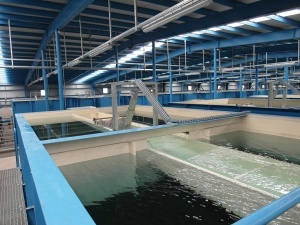 Contact us today for more information on our water treatment plants. One of the most important things that private developments and small communities should secure is safe drinking water. Most people often fail to realize how important this is to their overall health, and many are simply content with water that “looks” clean.Unfortunately, we can’t always judge water’s cleanliness by just looking at it. More often than not, the really harmful organisms and particles can only be seen under a microscope. Out of carelessness, these can find their way on our taps and drinking fountains. At AshtonTucker, we know how important it is to ensure the safety and drinkability of water. We provide packaged water treatment plants as a low-cost solution for private developments and small communities. Our package plant is a smaller version of a water treatment facility, and the combination of buoyant media absorption and granular media filtration makes sure the water that goes into your tap is always safe to drink. Despite being smaller in size, it integrates all the important parts in the water filtration process, such as aeration, coagulation, oxidation, and sedimentation, to name a few. In addition, we offer water treatment plants in areas that are metal heavy; we also remove traces of iron and manganese in water.